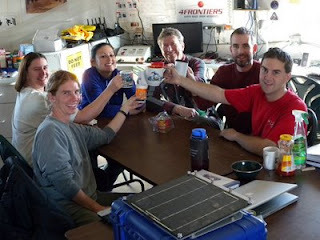 Last night as the FMARS crew was sitting down for dinner after a long day of work, we checked the weather forecast and noticed that high winds and colder weather were expected starting the next day. Although I was already pretty tired after my first real EVA the day before and being the out-of-sim person on EVA #4 that day, I decided that getting the seismic station installed then was important given the potentially worsening weather situation. I asked for volunteers to go help me; Vernon and Christy stepped forward. We started suiting up after dinner and were out the door by about 8:30pm. Christy and I were in sim (wearing mock space suits), and Vernon served as our polar bear watch and photographer. After the usual trouble getting our ATVs to run, we managed the 3 km traverse to Marine Rock without any difficulty. The pictures below show Christy and I carrying all of the equipment we needed to install the seismic station. This particular setup is very compact and lightweight - a plus for astronauts. More on that later. We had already explored Marine Rock the day before, so when we reached it this time we got straight to work installing the station. First, we mounted the Ethernet radio antenna on the mast we had erected during our previous EVA #3. This wasn't very difficult except for feeding the zip ties through the small holes of the radio and affixing it to the tower. Next, we laid out the cable about 100 meters from the communications tower to where the seismic station itself would be. Then we started digging. A running joke among some seismologists who do field installations is that we get to travel all over the world in order to dig holes. It's true. I've been all over this planet from the poles to the equator and dug many holes to house about 100 precious seismic instruments. From this experience, I've learned to anticipate the types of ground that make for good digging and how to dig a hole that's just the right size for a given seismic vault. - That's what we call the enclosure that surrounds, protects, and insulates a seismometer. In this case, we only had to dig a hole about a foot deep by 9 inches in diameter to house the small Nanometrics Trillium Compact carrying/insulating case that serves as the seismic vault for this station. That's about 4-5 times smaller than the holes I'm used to digging for seismic stations. On one hand it means there will be less earth to help insulate the seismometer from fluctuating temperatures and winds, but it certainly is easier for astronauts like us to execute wearing our space suits. Plus, it means we have to carry less material into the field; Just bring the carrying case and that's it. We didn't have a proper shovel or spade for the task, but a small pick helped us get the hole started, and flat rocks found in the vicinity proved very useful for sculpting the hole. After we'd dug the hole, I pushed the spikes of the special "tripod deployment cradle" into the soil at the bottom of the hole. This is another innovative new product from Nanometrics that allows for very quick and easy leveling of the seismometer. Normally, I'd pour a concrete pad, wait for it to dry overnight, and level the seismometer using its small screw-adjustable leveling feet. In this case, I found that while leveling the seismometer with the tripod cradle was indeed very easy (even in astronaut gloves), keeping it level was a challenge because it's very difficult to get the compact cover to fit over the instrument without bumping it. After a couple of false starts and having to widen the hole a bit, I managed to satisfy myself that I'd gotten the cover over the seismometer without moving it. The Nanometrics Trillium Compact seismometer itself is a very impressive little device. At only 5 x 3.5 inches in size, it's hardly bigger than a soda can but boasts semi-broadband performance with flat velocity response from 120 seconds to 100 Hz. There are no locking masses or mass centering to worry about, which is much appreciated by this clumsy astronaut seismologist. It only consumes about 160 mW of power, so the station can run off a small solar panel without difficulty. It even has an integrated web server built into it. Christy and I then turned our attention to hooking up all of the cables to the Taurus digitizer. I like this seismograph a lot because it has a built-in color screen and fairly intuitive menu system for configuring the station. This means you don't need to bring a separate computer to interface with it. The five large buttons on the front are theoretically big enough for use by bulky gloves like astronauts would wear, but their responsiveness could be improved. I found that I had to push them very hard and hold them for a couple of seconds to get them to work. Sometimes using a rock instead of my finger helped. The only thing I don't like about the Taurus is typing alpha-numeric information like the station name or IP address. Imagine texting on a phone but only much worse. Fortunately, one can take care of that kind of configuration before going to the field. The blue case housing the equipment in the photos here is another one of Nanometrics innovative offerings. It's a complete seismic station in a field-ready transport case. Everything needed to install the station except the vault fits in the case including the seismometer, cables, digitizer, battery, charge controller, and solar panel. The solar panel mounts on a special bracket on the lid of the case. Christy and I had a hard time tightening the screws that hold the solar panel on the bracket. This seems to be the weak link of the design, and I am concerned about how well it will hold up in high winds. I hand-carried the case to the arctic since it easily fit into the overhead bin of all planes I flew up here. Suitcase-sized systems like this are what astronauts need to easily transport their equipment to the field. Below you can see me with the completed station. Altogether, the EVA lasted 2.5 hours. That's a pretty quick seismic installation time on any planet. I'd like to thank Nanometrics for loaning the Trillium Compact station to the FMARS 2009 mission. Astronaut seismologists exploring the Moon or Mars will need user-friendly, compact systems like this to accomplish their geophysical objectives. Nanometrics is definitely ahead of the curve in developing a product that could have such extraterrestrial application. You can read more about this EVA in the EVA #5 Report. Also, this is a little off-topic but sometimes I get an error message when I try to post a comment on your blog. I have learned the trick is to select who I am commenting as FIRST from the drop down, then type the words in the text box. Just wanted to mention that in case anyone else has that error. Great post Brian! I'd love to try out Trillium's products some day. Two and a half hours is a super fast time to get a station up! We just spent three days with four people to get our newest site installed, FXWY.